Bad news for the government’s workfare plans. Recruitment companies getting tens of millions of pounds of taxpayers’ money to find jobs for the unemployed are at the centre of a fraud probe after staff made false claims of getting people into work. The Observer found that A4e, one of the government’s biggest private contractors, is at the centre of the Department for Work and Pensions inquiries. It is understood that at least two other recruitment companies have been probed by the DWP. The revelation comes weeks after A4e was earmarked for £100m of contracts for the government’s Flexible New Deal, in which private companies will be paid for each person they place in a job. Anyone want to try and persuade the public that funding corrupt recruitment consultants is a worthwhile use of taxpayer’s money? Well, what a surprise about A4e. Last year I was recovering from illness so found myself seeking help from A4e so that I could get back to work under their Government Jobcenta related assistance to people like me. So I went to their office a few times and met some of their “advisers”. Their assistance seemed to be limited to them looking for jobs in the local papers, websites and, of course, the Jobcenta Plus list of vacancies: all things I can do for myself. I asked if they had any contacts with local employers and found that they didn’t. They did help me a little bit with with one job application in that they put the application in for me so, I guess, they could claim their payment if I got the job. Well, fair enough, I’m not begrudging them payment for work they do but I could have just as easily applied directly myself and if I had done would not have flagged up the fact that I had been recently off sick, which is not necessarily a plus point with employers. I did get an interview for this job but didn’t get selected: it was a job that had been advertised in the local paper. Then, as I was feeling better, recovered and ready to work I ceased claiming Incapacity Benefit. The people at A4e were clearly unhappy about me stopping my claim since they were only paid for helping people on Incapacity Benefit. One of them advised me to keep claiming. Instead I started claiming Jobseekers Allowance, which, because of my circumstances I didn’t get and, after finding there was similarly not much assistance, stopped my claim for that too. The real problem is that contrary to Cordon Bleu and Peter M’s assertions, there are very few jobs out there at the moment. So wasting money on A4e and other contractors so they can give phoney advice to those looking for work is wrong. It’s also potty that those unable to work because of illness are targetted (”we want to look at work you can do, rather than work you cannot do”) while there’s not so much help for those fit enough to work: most employers want employees who are fully fit. There’s also not much training available, just some Learn Direct courses on English, Arithmetic and Word Processing. But what’s the point of doing training if there are no jobs out there? ‘Order reigns in Tehran!’ You stupid henchmen! Your ‘order’ is built on sand. Tomorrow the revolution will already ‘raise itself with a rattle’ and announce with fanfare, to your terror: I was, I am, I shall be!” (OK so in the original Rosa Luxemburg quote it’s Berlin rather than Tehran, but the sentiments still apply). 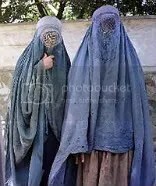 Ever since the staggering news broke that Nicholas Sarkozy believes the burqa is “not welcome” in France, a debate has been raging amongst rent-a-gob talking heads in the UK about whether or not a ban on wearing the burqa should be instituted here. Except the problem is that there is only one side in the debate, and it is flailing at shadows. The latest example was this morning on BBC1, when Nicky Campbell’s panel show “The Big Questions” featured the item. It was all standard Sunday morning popcorn fare, with Peter Hitchens being crotchety and (in news this blog finds especially reassuring) the return of a familiar face in the form of the still-delightfully-weird Yvonne Ridley. And so “debate” they did, some people against the idea of wearing the burqa, others in favour of it as a religious duty, others still defending the practice on the even more spurious grounds that it is a “feminist gesture”. Much ya-boo-hiss knockabout fun ensued. The problem they had, of course, is that there is no prospect of a legislative ban on the wearing of the burqa in the UK. It ain’t gonna happen. Furthermore, almost no prominent figures in the UK, whether they approve of the burqa or not, support legislating for a ban. The debate about the ban is therefore completely redundant. For all the difference it would have made in terms of political relevance, Campbell (and Dimbleby on last week’s Question Time, and Old Uncle Tom Cobley and All previous to that) might as well have picked a debate about whether one can indeed get better than a Kwik-Fit fitter, or whether one prefers Daddy to chips. Of course, the burqa is one of those subjects which provide an endless opportunity for blow-hards in the media and on the blogosphere to vent hot air. The reality is rather different. You can approve of the burqa if you want: personally I think that if you do, you’re defending a culturally specific and socio-politically reactionary practice which is not laid down in the Qur’an, but equally that’s just my view and besides, frankly I don’t really care to debate it out that much as I’m not a Muslim. However, that doesn’t mean that I think the law has any business interfering in people’s right to believe nonsense on any number of unrelated subjects. For instance, I strongly disagree with the idea that the human race owes its current situation to a volcano-dwelling alien called Xenu. Do I (and others) mock Scientology ruthlessly on this blog as a consequence? Yes. Is it then right to call for state intervention to stop Scientologists from practising what they believe, such as the silly tin-can stressometer thing? Absolutely not. The reason? Secularism, my friend. One of the most mis-used words in the religious and political lexicon, it refers to the state being free from religious control. Religious belief should be allowed free rein a secular society, and if that means that some women choose to wear an archaic piece of clothing then it is their right to do so. The state only has an issue where religion encroaches on its power, and if that is our primary concern then women wearing silly clothes should be the least of anyone’s worries. All of which rather strikes me as being common sense. Not that it means the “debate” is likely to stop. Yvonne, Peter and all the others do have bills to pay, you know. Now, the prisoners have done it again in memory of the “troubled” pop singer. We’re always happy to pass on good news from reliable sources. This comes from the Socialist Party, who we at Shiraz don’t always agree with, but on basic working class struggle we have no problem with them. Our own Jack Haslam will, no doubt, soon add his own comments on this great victory. Lindsey Oil Refinery construction workers have won a stunning victory. All the workers’ demands have been met. The 647 dismissals have been withdrawn, the 51 redundancies rescinded and all employees have been guaranteed a minimum of four week’s work – what they would have got if Blackett and Charlton had taken them on – ie as much work as is probably available. This victory has been achieved by the militancy and determination of LOR workers taking unofficial strike action and solidarity of at least 30 other sites, including power stations and petrochemical plants. This exerted enormous pressure on the full-time officials of GMB and Unite who, while repudiating the unofficial action, were then forced to give the recent strike official dispute status once the 647 were dismissed. The role of the LOR shop stewards and the strike committee was crucial in giving a clear uncompromising leadership. The shop stewards committee, under the suggestion of Socialist Party member Keith Gibson, was expanded into a strike committee in the second week of the dispute. By the end it included three Socialist Party members. The Socialist Party produced an almost daily newsletter that offered suggestions on the way forward for the strike, several of which were adopted. These newsletters were taken in their hundreds by pickets to other sites as far afield as Teesside, Elsmere port, South Wales and Nottinghamshire. As workers looked for ideas and showed their support for the Socialist Party 93 copies of The Socialist were sold during the course of fortnight. There are many important lessons of this dispute. The anti-trade union laws were brushed aside by the determined strike action and the solidarity. This was the third time this year that engineering construction workers have taken illegal action. Important lessons.It is important to highlight that the unofficial action was clearly solid and strong and that was the basis for the official backing which was then a source of confidence for the workers. Another important lesson is about the role of the shop stewards and strike committee and the role of the daily mass meetings where all workers were able to participate in the discussion and ask questions.
. Had the strike in January had official union backing from the start trade union banners and flags would have pushed the BJ4BW slogans into the background. This highlights the need for fighting trade unions with the election of full-time officials on skilled worker’s wages. Some on the left did not support the strike in January and February because of those BJ4BW placards. But the winter strike was primarily about defending trade union rights against the bosses attempting to divide the workers along lines of nationality by importing cheap labour to undermine the national agreement with a ‘race to the bottom’. The victory in February and again in May, when 16 sites took solidarity action in support of South Hook in Wales, gave LOR workers confidence to carry through this action over the last two and a half weeks. In January socialists on the strike committee countered the BJ4BW slogans with class unity demands and this latest dispute appealed for and won support from trade unions in Total in Antwerp. However this victory is not the final word. The battle is won but not the war. The employers still have their sights on breaking the national agreement and the trade unions. But this victory has strengthened the workers resistance. The employers, both Total and the sub-contractors, completely underestimated the workforce. The mass sackings made it clear that the dispute was about effective trade unionism and the national agreement. The employers have completely capitulated. They still want to break the national agreement but they have been weakened. Now a national ballot organised by both the unions is underway taking up the employers’ refusal to make a pay offer or give any guarantees of employment security in the review of the NAECI agreement for 2010. Buoyed by this victory the ballot should receive a big yes vote. The employers and the government will know that if they don’t concede engineering construction workers will strike until their demands are met. Let me say that this is not an attack on the left. I think that Lenny has written some excellent pieces on the Iran uprising and the position that John Wight holds seems to be a minority one shared only by Lenin’s crazy friend Yoshie ‘This Is Not A Revolution’ Furuhasmi and what’s left of the Respect leadership. Marcus has already dealt with this but there are a couple of points Wight made that struck me. Here he is explaining why leftists should declare solidarity not with the protestors fighting on the streets for their freedom but with the uniformed thugs attacking and killing them. Combined with a distinct lack of analysis of the social forces involved on either side of this dispute, this has led to many voices within the international left being raised in support of an opposition movement led by a section of the Iranian establishment motivated by sectional economic interests. It is a movement driven by students and Iran’s more affluent middle class. That such a powerful and determined movement has erupted should come as no surprise. After all, history teaches us that the more privileged layers of a given society are every bit as capable of taking to the streets to struggle for their interests as the working class and the poor, especially in the wake of an election that doesn’t go their way. In this regard the examples of Chile in 1973 and Venezuela in 2002 spring to mind. No democracy is without its imperfections. Under the Islamic Republic Iranians, no matter where they happen to live throughout the world, have the right to vote in elections. Women are debarred from standing for office, which is certainly regressive in itself. However, this differs from democratic elections in the West only in the sense that debarment here is based on economic status rather than gender. In effect this ensures that only the wealthy within western societies have any meaningful chance of holding high office. Wight doesn’t mention that potential candidates had to be vetted by the Guardian Council. Of the 475 people who put their names forward, just four were allowed to stand. For Wight’s analogy to work you have to imagine a UK where a) women are banned from running for office and b) all candidates have to be approved by a selection committee set up by the government that only lets a tiny minority of government loyalists through the process. These are the only original points Wight makes – the rest of the piece consists of the same cliched arguments for theocracy. Kissinger’s theory of Islamic fundamentalism as a bulwark against Western imperialism. ‘[I]n its resistance to US hegemony, in its material aid to Arab resistance against Israeli expansionism, [the regime] certainly plays a progressive role both regionally and globally.’ The needs and desires of the people who actually have to live under a theocratic regime don’t enter into this calculus. The closed nature of the Islamic Republic means that we are unlikely to find a memo saying: ‘Let’s steal this election and kill anyone who disagrees. Signed: Ahmadinejad’. Because of this lack, we are to believe that the erratic voting patterns seen in this election, including entire cities and provinces voting against tradition, huge percentages changing political allegiance overnight, the lack of regional variations, the fact that turnout exceeded eligible voters, that this increase did not show a swing in support for Ahmadinejad, the fact that Khameini approved the results almost immediately instead of using his three-day consideration period, and that the election was followed by a communications blackout and a vicious crackdown on dissent – all this is to be ignored and Ahmadinejad’s victory taken on trust unless and until an Islamic Freedom of Information Act reveals the smoking gun. Except that rural income has stagnated under Ahmadinejad. The Iranian working class has been hammered by unemployment, privatisation and the repression of trade unions. Mousavi has nothing to do with these protests. I forget who said that the tipping point in a revolution is not when the state is at its most oppressive but when there is some relief or slackening, a rent in the fabric of dictatorship. For Iranian dissidents the election was that rent and they are tearing the canvas apart. The whole world is watching. And that’s why, when I read about Iran, I don’t hear the words of Marx or Engels but those of Leonard Cohen: ‘There is a crack in everything/That’s how the light gets in’. “They are resorting to all kinds of intimidating and repressive tactics to prevent our actions in Tehran. We are accused as subversives and saboteurs. To crush our protest, the security forces are using tear gas, batons and are threatening to shoot us. Hundreds including wives and children are being arrested and sent to Evin prison”. Is this a recent report from Iran? Another scene of violence in the midst of political turmoil after the Presidential election? Yes, it came from Iran but this account dates back to January 2006 when a one-day bus workers’ strike was crushed by the police, intelligence services and company thugs. Such oppression was repeated last month (and in many other instances), when the authorities stopped a May Day celebration with force. Plain-clothed officers and police attacked, beat and arrested the participants and passers-by. Streets were full of mini-buses and vans to take away the detainees. Out of the 2,000 people that gathered, more than 200 were taken into custody. The police broke the cameras and cell phones of anyone who tried to document the event. For those of us who have been campaigning for workers’ rights in Iran in the past, we could only imagine these scenes of brutal attacks from the words that we read. Now, for the first time, we can visualise the notorious Basiji, security forces and snipers in action as film footages and photographs of the popular protests continue to channel out of Iran. And I am outraged once again. It reinforces our view that some essential things are missing in this country. US President Barack Obama in his short statement on Iran on 20 June touched upon “the universal rights to assembly and free speech”. Nobody will disagree with that. Let’s make sure, however, that workers’ rights – freedom of association and rights to bargain collectively to begin with – are on the list, too. Iranian workers and their basic rights have not been respected over the years. Instead, hard and honest working people and their families have been asked to tolerate their living and working conditions and limit their freedom and rights. Bus union leader, Mansour Osanloo, in his interview with the ITF’s magazine, Transport International (October 2007) talks about “low wages and long working hours; the use of outdated vehicles; drivers’ fatigue caused by heavy road congestion; staff redundancy and management’s corruption” as pertinent issues that united the workers against their employer. According to the Annual Survey of Violation of Trade Union Rights (2008) by the ITUC, the minimum wage set by the Iranian government is US$140 per month, while the official poverty line stands at US$300 a month. Nearly two million workers have not been paid – some for nearly two years. In the meantime, the Workers’ House and Islamic Labour Council, which the Iranian government set-up after the 1979 revolution to replace trade unions, have failed to deal with these issues. In principle, they are part of the system to oppress the workers, not to represent their interests. That is why the bus workers in Tehran, teachers in different cities, sugar workers at Haft Tapeh in southern Iran and workers in Kurdistan have stood-up despite all the oppression that they could be confronted with. The two puppet organisations join these attacks. In one case, they went on to cut Osanloo’s tongue. We see two faces in this oil-rich country today. One side wants to maintain and reinforce the values of the 1979 revolution as enshrined in their Islamic constitution. On the other side we see the introduction of “most advanced” aspects of Western agenda such as privatisation and precarious employment. Some may wonder how this chemistry will mix. The formula will work if they supplement each other to keep the rich classes in their comfort zone whilst driving the vast majority of the population into poverty; at the cost of incorporating massive potential contradiction in the Iranian society. People are protesting in the millions despite the highest level of warning coming from the political leadership of the country. They feel betrayed over the election result. This spontaneous rebellion is, however, like the ignition of the fuse. In its extension we can see the frustration of the masses that is about to explode. Something that was accumulated over years of negligence in an unfair and unjust society. “Failure of economy”, “nepotism”, “corruption”; these are the words that you can already pick-up from the Iranian bloggers on the internet. So the next crucial question lies in front of us. How will the independent unions be dealing with these unprecedented socio-political circumstances now that the Pandora’s box is opened? The bus workers’ union in Tehran did not endorse either Mahmoud Ahmadinejad or Mir-Hossein Mousavi because neither candidate responded to the Open Letter that the union released in May. The union questioned all the candidates on issues related to basic trade union and human rights as well as topics such as minimum wages, job security and creation, housing, medical and unemployment insurances and temporary contracts but they were ignored. Moreover, the union correctly points out in its latest statement from last week that the demands of the masses now go beyond the capacity of any particular political group. It is no longer about choosing an existing party over another. Rather, the question is how the foundations for basic freedom and rights could be structured in the Iranian society; and by whom; and for whom? The principal pressure is coming from the Iranian people themselves. The authorities cannot blame it on any external influence. International trade union organisations have been one visible force with its long-term campaign to support the independent workers’ movement. Whilst the leaders are still in jail and the unions are under attack, experts confirm an unprecedented growth of the workers’ movement and an escalation of struggles in Iran over the past few years. Union lawyer, Yussuf Mollaie received a trade union rights award on behalf of the bus workers’ union last October in Brussels. He said in his speech that Iranian workers are aware of the solid support from the international community. “When we raise our fists, we know that we are not alone”. The four global union organisations, namely the ITUC, EI, ITF and IUF have formed its coalition “Justice for Iranian workers” weeks before the results of the election and have called upon unions around the world to take part in the Global Solidarity Action Day on 26 June to further promote trade union rights in Iran. Amnesty International is actively supporting this worldwide event. The people in Iran are now raising the fists in their attempt to end the “threats, arrests, murders and brutal suppression” that were set against them systematically for years. This global Action Day will, therefore, be a touchstone where trade union rights and human rights will be integrated into a wider and stronger popular movement in Iran. To achieve that objective, trade unionists and human rights activists around the world must give their full support on 26 June and beyond. Click and join our campaign! The GMBunion has revealed that two senior managers at Lindsay Oil Refinery site Richard Rowlands and Ian Elliot instructed a contractor on site, R Blackett and Charlton, to hire 61 new workers although they knew that the original contractor Shaw were about to make 51 workers, doing exactly the same jobs, redundant three days later. GMB claim that Richard Rowlands and Ian Elliot did this deliberately in breach of agreements and accuse them of provoking the unofficial disputes in the engineering construction industry. R Blackett and Charlton were brought on site in spring 2009 to be the employer for the 105 new jobs that were created as part of the ACAS brokered deal in the spring. Laying off these 51 workers is in breach of an agreement by Total and the main contractors Jacobs that no workers on the site would lose their jobs as a consequence of IREM taking over part of the work undertaken by the Shaw workers. It was also in breach of the industry wide agreement whereby the Project Joint Council for Lindsay Oil Refinery site, which is co-chaired by Jacob, organises the movement of labour on the site throughout the life of the project. ‘This is probably the most important dispute the construction industry has seen for 30 years in defence of the national agreement’. That’s how Keith Gibson, one of the sacked Lindsey workers, summed up the significance of their battle to fellow workers at the mass meeting this morning (Monday 22nd June). The mass meeting was followed by the symbolic burning of hundreds of letters telling each of the 647 workers that they had been sacked and had to re-apply for their jobs today. The workers have been locked out after taking solidarity strike action in support of 51 Shaw’s workers who have been made redundant. The redundancies, which have taken place while other contractors have been taking people on in defiance of agreements to re-deploy existing workers first, are seen as deliberate victimisation. The Shaw’s workers are being targeted for the strikes earlier this year in defence of jobs and the national agreement. According to Keith Gibson writing in The Socialist the workers are demanding the withdrawal of all redundancies, a stop on all overtime, and the sharing out of the work remaining on the HDS3 Project. The dispute comes after GMB and UNITE shop stewards from across the industry had voted to ballot for strikes after failing to reach a deal with the employers to renew the national Engineering construction agreement that has been in place since 1981. The issues in dispute included a proposed pay freeze and the employer’s refusal to give any guarantees on job security. Specifically the unions want the employers to agree to implement the Posted Workers Directive properly within the industry by ensuring that all workers receive everything that the agreement says they are entitled to. The employers were only willing to offer a code of practice on this rather than make it binding. Whether or not the Lindsey dispute represents a concerted attempt by the employers as a collective to jump the gun and provoke a battle on their terms, or on the contrary, it is Total management who have jumped the gun is a moot point. A leaked circular from the employer’s organisation that stewards have obtained had warned companies to resist provoking battles on any other issues till the national agreement had been dealt with. Whatever Total management’s original motives for the sackings, this dispute will be a test of solidarity on both sides. If the strikes spread and stay solid, this will pile the pressure on Total from the other companies and the government to back down and settle. But if the solidarity wave falters, then other employer’s might seize the opportunity to press ahead with their own victimisations and to weaken the ability of the unions to defend and extend the national agreement. The govermnent has also adopted a much more concessionary tone than over the January strikes when Mandelson, along with his poodles amongst some sections of the far left, denonced the strikers for xenophobia. Amazing, isn’t it, what an electoral disaster and the need for funds to fight an upcoming general election, can do for union government relations. So, at this stage in the dispute, the forces that could be ranged against the strikers are far from united. The stakes are very high. This is a chance to stop the ‘race to the bottom’.